Tanker freight market is renowned for exposing freight risks to market participants due to the great freight volatility. Forward freight agreements (FFA), as principal-to-principal derivatives contracts, are traded for hedging freight risks as well as speculation. It is deemed that in tanker freight market, there is lead-lag relationship between spot price and forward price. Moreover, the price discovery function of the forward price plays an essential role in tanker freight market to guide future spot price. Hence, researching on these subjects has vital economic and practical significance. 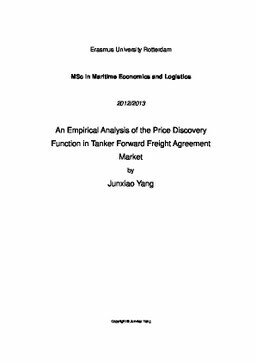 This paper employs vector autoregressive model (VAR) to analyze the lead-lag relationship between spot price and forward price in tanker freight market as well as the effects of the price discovery function of FFA in-depth. The results of this paper would provide some references for market participants to manage risks and make better strategies.